I made this for Joe on Father’s Day and thought it would make a great 4th of July treat as well. It was one of the few things he has ever asked me to make. He was real stingy with his ice cream but when Little Man Z crawled in his lap he found an extra spoon to share. He’s our new kitty and so adorable. You should see the two of them sit together and eat ice cream. This version is really simple and tastes like you went to your favorite ice cream shop. I made up a batch of my homemade vanilla ice cream and added caramel sauce, a little coarse sea salt and praline pecans. Honestly, I think homemade ice cream is key but if making ice cream isn’t your thing, well just go out and pick up 1 1/2 quarts of vanilla ice cream. 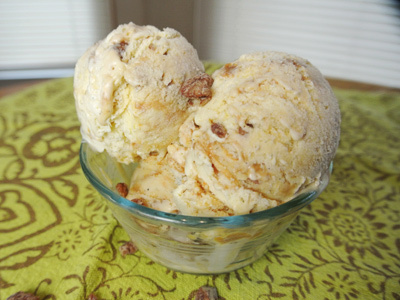 If you are the ambitious type and want to make everything yourself, I have links to my homemade vanilla ice cream, salted caramel sauce, and vanilla sugar glazed walnuts (just sub in pecans) that will get you the same results. I’m devoting this week to holiday pies! Pies are my favorite dessert no matter the occasion but around the holidays I like to make a variety so we have choices. I think a slice of pie brings back recollections, particularly around the holiday season, of times spent with family and friends. There are many different layers of flavors and textures (fruit pies, cream pies, pies with meringue, custard pies, frozen pies, well you get the picture) in which to choose from. 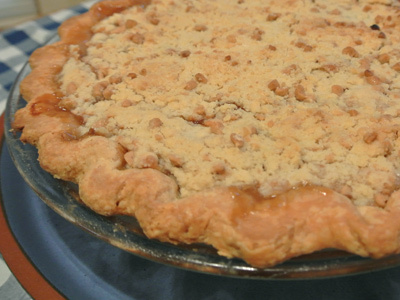 One of the pies I’m making this year is a Salted Caramel Apple Pie with a Toffee Crumble. This one is for Joe who loves any pie with a crumbly topping. I tried a new recipe for an all butter crust which I found easier to work with and made a really pretty crust. I can’t wait to taste it but I’ll have to be patient as it went straight to the freezer for safekeeping until the holidays. The temptation was overwhelming as the aroma of warm apples and caramel filled the kitchen. As far as apple pies go, I think this pie will be hard to beat! Nothing feels more like Autumn than the aroma of warm apples and spice filling the kitchen. 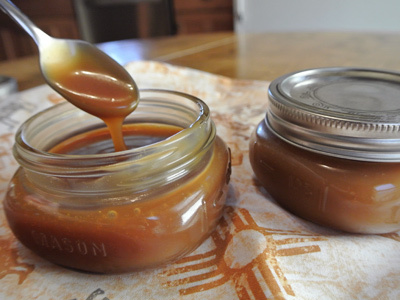 My salted caramel sauce was sitting in the fridge waiting to be used for more than just a topping for ice cream or dipping apples. 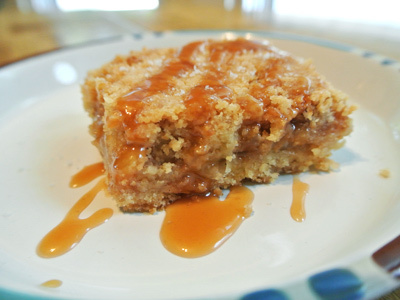 I had been contemplating a caramel apple pie but in the end I decided on these Salted Apple Caramel Bars. I pulled the pie recipe and used it as my guide for the filling and topped it with a drizzle of salted caramel. These are a treat any time of day but I especially loved them in the morning after drizzling a bit of caramel on my bar I would dip the caramel coated spoon into my coffee . . . Yum! I don’t know about you all but it sure is feeling like Fall around here in the Midwest. The morning air is crisp and cool and it’s so refreshing to be able to open up the doors and windows for some fresh air after a long hot summer. I’ve been thinking of fall baking and patiently waiting on my homemade Vanilla Extract and Vanilla Sugar which still need a few weeks for the fullest flavor to come through. I found another tip on that same holiday episode of “Kelsey’s Essentials” on how to make Salted Caramel Sauce which can be used in so many recipes. It looked so easy that I had to give it a try. My first attempt, I had a hiccup when I read the recipe too quickly and ended up with rock candy instead of caramel syrup. The key is patience and no stirring. My first batch I stirred furiously and when the liquid evaporated it was like a vacuum sucking the water out and the sugar crystallized in seconds. I was devastated at first wondering what I did wrong, so I looked at the the recipe again and there it was plain as day, it said NOT to stir once it begins to boil. Well, I gave it another go and this time I had the tastiest caramel sauce ever.